What? How can there be any cons associated with having a furry best friend? But then I realized that some of the things one must do to take good care of their dog can be seen as cons by some people. And I realized that talking about those cons is really important as it helps filter out future dog owners that would eventually abandon their dog, leave them on the streets or neglect them and not treat them the way they deserve because they weren’t aware of all the responsibilities and “cons” of having a dog before they adopted. It is important to help people look at all the aspects of having a dog so that they can better decide if they will be able to care for a dog for as long as the dog is alive and not just until it is convenient for them. I believe most of the people, just like me, cannot imagine ever abandoning their dog or not treating them right, so to us, these cons will be negligible. But if the following responsibilities and obligations seem too much for you, and something you might not be able to handle further in life, maybe you should think it through again before adopting. Every dog deserves an opportunity to get a loving home and a family where they’ll stay for the rest of their life and where they’ll be happy and well taken care of. 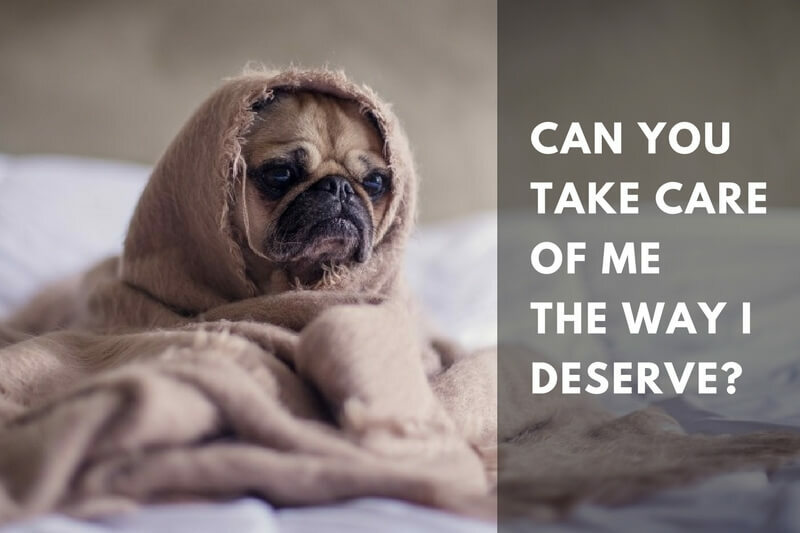 it is traumatizing to never get to go for a walk with their human. Your dog will depend on you for food, water, walks, cuddles… You will have to devote your free time to care for your dog so they would be happy and all their needs would be satisfied. If you travel from time to time, or even only spend the night somewhere else, you will need to hire a pet sitter, or have your family or a friend take care of the dog during that time. Your dog has to take a walk during the day and, of course, they need to eat, pee and everything else which requires your or someone else’s presence. Grooming supplies such as nail grinders, brushes, shampoos etc. You’ll need to be patient and train your dog to behave, that is if you adopt an adult dog that wasn’t already previously trained. Teach your dog household rules such as not to jump on the furniture, not to steal toys etc. Training requires time and patience, so you’ll need to spend some time training your dog so that there won’t be any issues later on. Cleaning after your dog will be your new daily activity. Dogs poop anywhere from 1 to a couple of times a day and there’s no getting around it. You will need to scoop those poops on the street, in the park, or anywhere else your dog will like to do its business at. Dogs can be a lot like children. They can be clumsy, not caring about the things around them. They are playful and it is a matter of time when they might chew something they shouldn’t or knock something over. So, if you’re preparing to get a dog, you will need to have the patience for those small accidents. If you adopt a dog that sheds a lot, you’ll need to clean more often than you normally would. Hair will be on your couch, your bed, on the floor, basically everywhere in the house. You can take a look which dog breeds don’t shed a lot. For me personally, none of these things are an issue or something that would discourage me from getting a dog. These *so-called cons* are just one small part of a beautiful friendship between a human and their dog. But of course, all people are different and some people might see it differently. For me, the pros of having a dog exceed the cons by far and there are so many pros to having a dog. Stay tuned to read my new post about the pros of having a dog. 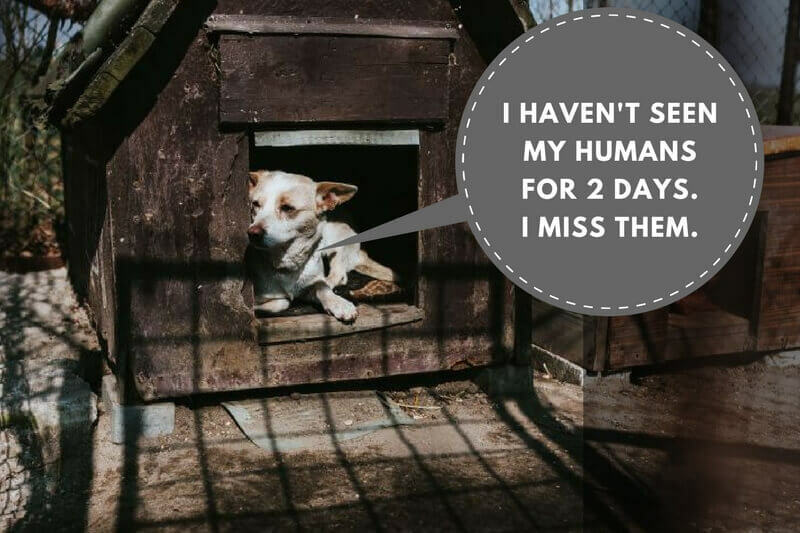 If you are ready to take care of another living being for as long as they live and these cons don’t make you think you can’t do it, then I encourage you to go and adopt your new best friend! Awesome post! I believe we’ve been going about this the wrong way the whole time! Instead of promoting all the “warm and fussy” of having a dog, promote the opposite so you know exactly what dog ownership is about. People forget a dog and a cat is like having a child. They are NOT easy care at all and run out just as expensive as any child might. This is such an important article for anyone considering their first pet! Sometimes we enter these decisions on a whim or excitedly and think we planned it all out but until you actually have a pet, you have no idea what all is involved. Getting a pet should be weighed as heavily as having a child! This is even more important as we enter the holiday season and many people give pets as gifts which is 99.9% of the time a horrible idea! Thank you for spreading such awareness and your through informative article on getting a pet! I agree that giving someone a pet as a Christmas gift is mostly not a good idea. To many of those ‘gifts’ end up abandoned in the shelter. Great post! Most only look at the positives and forget about the responsibilities a dog really is. By educating this way maybe we cna reduce owner surrenders! This is such an important post! It’s unfortunate that so many people don’t consider everything before bringing a pet into their family, and as a result, pets are turned into shelters and rescues way too often. Thank you for bringing these “cons” up and talking about them. Though I have to agree — none of these things would deter me from having a pet! I was never ready to have a dog. I’m still not. But I’m thankful for every one of them. And Cookie is so happy. I think the main things for us are expenses and having to figure out care on the rare occasions when we can’t take him. Pros definitely outweigh the cons though! People definitely need to be aware of the ‘cons’ of owning a dog. Sadly, they see a cute puppy and don’t think about all it entails and then are shocked that you have to be up through-out the night! For me the pros definitely out weigh the cons, we love our dogs and wouldn’t be without them. Wonderful post and I sometimes feel people do not think about what it takes to have a dog in their family until something happens. That is something I point out to many people when they say they want one. I have Layla and could not see my life without her. I agree that there are a lot more pros to having fur children in our lives, but people must research and prepare before bringing a dog or a cat into their homes. Too many people love the cute little puppy or kitten and don’t think about the commitment to raising them, taking care of them, and loving them for a long time. There is so much responsibility to owning a dog. It is like having a child that never ages. It is not for the faint of heart but there are so many benefits if you are willing to put in the small effort. Great information! I once told someone who was pregnant and wanted to get a dog, that she should figure on spending 2 hours a day with a young dog and maybe only 1 hour per day with an older dog. She never realized how much time you need to spend playing, training, walking and exercising a dog! I love spending the time with a dog, but many people don’t want to be that devoted. Yeah, sometimes people have an unrealistic image in their heads when it comes to taking care of a dog. This is great! It’s actually very important to talk about these things because you’re right, taking care of a pet is a lot of work and those who want one need to be ready for the responsibility. Pets really are like children! I hate hearing stories about pets that are abandoned because the owners couldn’t take care of them anymore. So important to educate people so fewer dogs end up unhappy or in shelters. Getting a puppy or dog is a huge commitment. I have to juggle any time I want to travel or even have an all day event. Kilo the Pug demands at least an hour a day of cuddles and play plus 3 or 4 walks, plus meals/treats and training and vet bills etc. He gets hair everywhere, makes messes and can get anxious/defensive. He is so worth it to me but clearly he was not to the 4 homes before me. Great post. So many people see a cute puppy and don’t think beyond that point about care for their pet and the cost and sacrifice. I remember when I volunteered for an adoption organization, seeing emails from owners wanting to surrender their pet because they had a vacation planned or moved to an apartment that didn’t take animals. I just don’t get how people don’t consider all the pros/cons that come with pet care. People need to treat pets like children, they have to adapt their lifestyle around the pets. They (pets) are not just cute play things or toys, they are living beings that require a lot of responsibility. Very true. It is so sad that there are so many people out there who don’t see their pets as part of the family and want to get rid of them when it gets hard or the dog is not a cute little puppy anymore. Great post because people need to know that having a dog is a lot of hardwork and is not always picture perfect. Not owing a dog is 10000% times better than irresponsible ownership that ultimately harms the poor animal. I grew up with dogs, so to me, the maintenance requirement is just part of life. I can see how some people might underestimate the time it takes to train a dog. Dogs are worth it though! It’s really important for people to consider all of the aspects of having a dog in their lives, and knowing those responsibilities are for the life of the dog. I love the “spin” you put on this post, it’s a clever way to let people know they need to thing about what it means to be a good and responsible dog owner! This is such a great post, thanks for writing it! I’m always promoting breed specific rescues, so many people still don’t realize they exist! Anyone can have the dog of their dreams without buying one online or from a puppy store. I am still learning so not sure how much credibility I have as far as comments go but just looking at it through my inexperienced eyes it answers a lot of questions and brings up points that people need to think about before adopting any pet. Kudos to you. Love pets with all your caring heart, and if you live someplace where you want one but can’t (like I do), make sure to visit loved ones’ pets and/shelters and pet stores often to get your furry or feathered friend fix!!!!!! And if you’re too busy, travel a lot, or just aren’t a very caring person (some people just arent… don’t feel bad about this if it’s you! ), then providing proper care will likely be out of reach for you. Neglecting an animal does serious harm, so please DON’T neglect! Far, far better to not create a problem in the first place.